The first three Presidents of the Republic of Texas reflected the various swings of political sentiment among Texas voters. Sam Houston was followed by Mirabeau B. Lamar. Following the Lamar term, Sam Houston was again elected President of the Republic and took office on December 13, 1841. Only a couple of months elapsed until the Mexican Army again attacked and captured San Antonio and Goliad. They were led by General Ráfael Vásquez, who had opposed the centralization of power under Santa Anna and was one of the figures in the attempt to establish the Mexican Republic of the Rio Grande. He and his division of 700 soldiers surprised the Texan defenders. Vásquez’s troops only held San Antonio for a few days before fleeing to the border with the Texas forces in pursuit. There were a few more months of relative peace until another division of the Mexican Army, this time led by Antonio Canales Rosilio, again attempted to invade South Texas in June and July, but were met and driven back by Texas forces near Ft. Lipantitlán, in Nueces County, returning to the site of an earlier key battle for the Republic of Texas in 1835. In the fall of 1842, General Adrián Woll again captured San Antonio and were met by Col. Caldwell and Capt. Jack Hays’ troops and driven back to the border. Late in December, 261 Texans are captured in the Battle of Mier in which they met Mexican forces led by Pedro de Ampudia. This battle occurred around the current Ciudad Mier, in Tamaulipas, south of Falcon Lake and roughly where the Rio Grande makes a major easterly turn to the Gulf. Also during the year occurred the so called Texas Archive War in which Pres. Houston attempted to move the archived records of the new republic back to Houston during the various raids by the Mexican Army. It was a contentious move that was eventually stalled by the Texas Congress taking no action on the issue. 1843 was somewhat less eventful with notable operations including the Snively expedition in which Jacob Snively led troops to attack Mexican traders returning from Missouri on the Santa Fe Trail in the spring and summer of the year. This was in retaliation for Mexican raids the previous year for the mistreatment of Texas troops captured in the Mier Expedition and Santa Fe Expedition. U. S. Troops moved to protect the Mexican traders and soldiers that accompanied it to quell a possible border incident between Mexico and the U.S. 1844 was likewise relatively peaceful as Santa Anna, again in power in Mexico, released all Texas prisoners. In December, 1843, Anson Jones became the fourth and final President of the Republic. Jones was a doctor by trade, having been born in Massachusetts. He had varying success in the medical profession and lived in several other places until moving to Texas in 1833. Though he served as a surgeon and judge advocate in the Texas Army, he remained a private during the war. He returned to his home in Brazoria and resumed his medical practice after the war while also becoming active in politics. Jones served as an envoy to the United States at various times during the first Presidency of Houston and the administration of Mirabeau B. Lamar. He was elected to the Texas Senate and served as Secretary of State until his election as the fourth and final President of the Republic. His main goals included trying to achieve the annexation of Texas by the United states which was accomplished in 1845. The Republic was abolished in 1846. Following Texas statehood, Jones was not chosen to represent the state in the U. S. Senate, those elections going to Sam Houston and Thomas Rusk, Reportedly despondent over this, Jones took his own life in 1858. 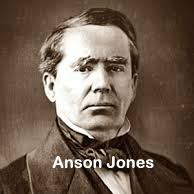 Jones County and its county seat Anson were named for him as were several schools elsewhere in Texas. It’s backbreaking work. I can identify!